Gillie and Marc believe that the role of art is to push boundaries and believe in the power of art to change opinions. Their goal with Run for your Life is to affect people so they’re inspired to do as much as they can to help save endangered species. In essence, here they turned their sculptures into public activism. 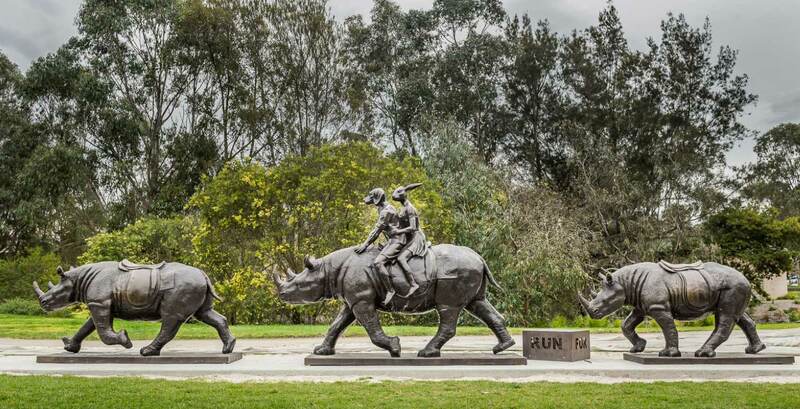 Run for your Life features three magnificent rhino sculptures that invite the public to be transported to the African savanna to be part of their run for freedom and life. The first rhino is ridden by Gillie and Marc’s iconic hybrid dogman and rabbitgirl characters and the smaller rhinos are there for everyone to jump on! 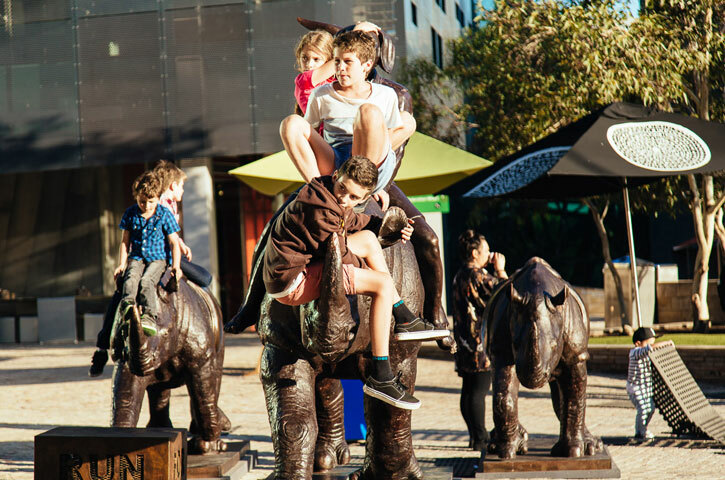 This installation brings the call of the wild to the city and to the people of Melbourne who already have a strong moral and environmental concern. Nearly 700 rhinos have been killed in South Africa in 2013 making it the bloodiest year yet for rhino poaching. Gillie and Marc’s sculptures hope to raise public awareness of the plight of rhino species in the wild. Now critically endangered, rhinos desperately need the active involvement of everyone to save their lives. 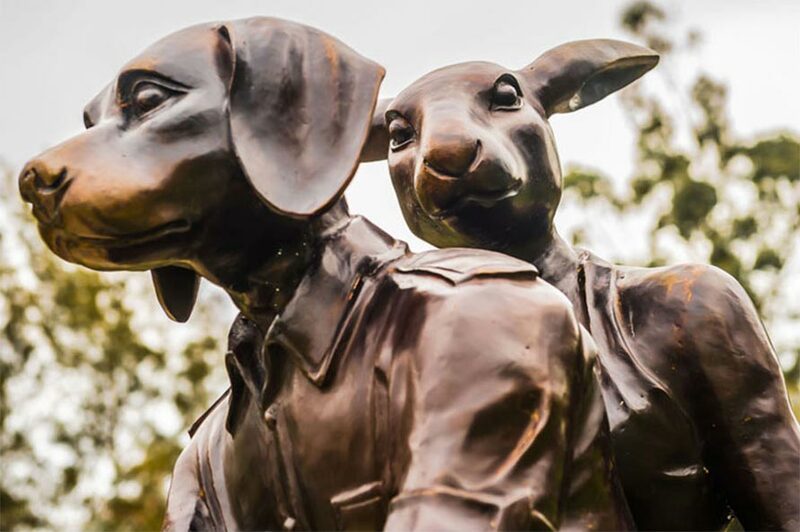 Gillie and Marc hope everyone who sets foot in La Trobe University can feel a connection to the three sculptures that spell out the rhinos future. Ride along with the majestic creatures as they run for their life! Drawn together by adventure and united by an insatiable creative thirst; husband and wife artist duo, Gillie and Marc have lived, worked and loved side by side for twenty five years. Applying the iconic imagery of the dog/human hybrid to most of their works, they celebrate the the powerful spiritual relationship that exists between man and animal. Gillie and Marc reference their own remarkable love story in their works, perpetuating a pursuit of happiness and encouraging us to challenge the status quo and the perceived safety of societal convention. Gillie and Marc’s unparalleled love is the cornerstone of what they are and of what they create. Meeting in Hong Kong, she was a nurse from England and he, a boy from the ‘burbs’ of Melbourne. Wanting only to find a soul-mate with which to share their passions for art, travel and adventure, seven days later they were married at the foothills of Mount Everest. They not only share an unsurpassed dedication to their art but also love for their two children, whom Gillie describes as their ‘best friends’. The work of these Australian contemporary artists has received acclaim worldwide and their paintings and sculptures are held in major collections in Australia and internationally. Together, they have exhibited their art all over the world, with over thirty solo exhibitions. They have been Archibald Prize finalists, won the Chianciano Biennale in Italy and have been crowd favourites in Bondi’s Sculptures by the Sea.